It’s 10 days out from the September 14th fight known as ‘The One’ and what have we learned that we didn’t already know? 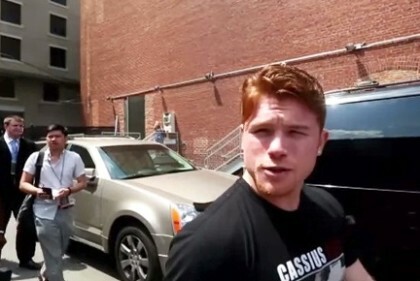 First of all we found out that Canelo is on course to make the 152lb contracted weight, this is the usual for him. We also know that Canelo has beaten a few of his sparring partners to a pulp forcing them to leave his training camp with injuries caused during sparring sessions. As seen during Canelo’s media day, Canelo punches a 300lb bag as preparation for a Money Mayweather KO. Floyd punches a 300lb man (Nate Jones)! Was it Canelo’s team that requested the 152lb catchweight? So says Leonard Ellerbe. What we’ve also heard or read from boxing writers is that Mayweather’s professional boxing style is just an extension of his amateur style. To this I say NO; Amir Khan’s pro-style is an extension of his amateur style! The results speak for themselves. GBP Chief Oscar DLH has once again picked against Mayweather, what else is new? Are Richard Schaefer and Oscar playing good cop-bad cop? Floyd Mayweather finally ADMITTED…”I can F***ING fight! No kidding. While Canelo and team have declared the current King dead, replacing him as the NEW King, exclaiming long live the (new) King! Now that’s CONFIDENCE! Uncle Roger and Floyd Sr. are getting along, with Roger working the mitts like only he can and Floyd Sr. giving instructions from the ring apron, wow, I just found the ME in team. Just having a little fun perusing over the events of ‘the event’ so far. In all seriousness fight fans are in for a great night of fighting come September 14th, even though I don’t see the main event lasting long. Reasons for the shortened main event will be revealed in a later ‘Money vs. Canelo: Just the Facts!” article due out the week of the fight. Next boxing news: It’s not What You Think, It’s What You Feel That’s Important!